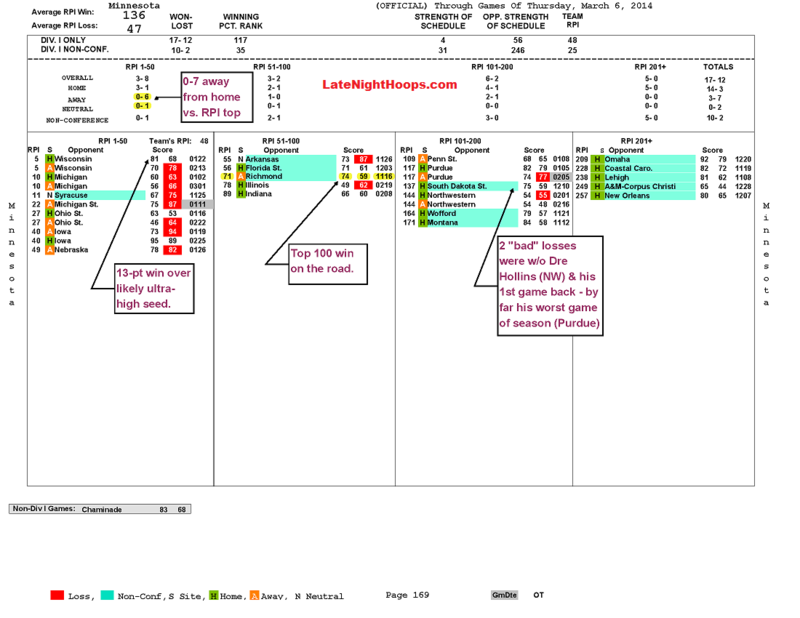 Increasingly there are media and fans who talk about KenPom.com. In theory, this is wonderful. We believe the site is an excellent resource and appreciate the continual work that Ken has been putting into it. A subscription is highly recommended. Much of the site is a database of information that many others calculate themselves. “Basic” advanced statistics for college basketball are difficult enough for much of the media and fans to understand, but when you get to the unique proprietary analysis (i.e., KenPom rankings), even those with a grasp of the basics are often confused. It may have sounded like hyperbole, but it wasn’t. The Gophers saw an enormous drop in their offensive rebounding percentage from 43.8% to 31.4%. 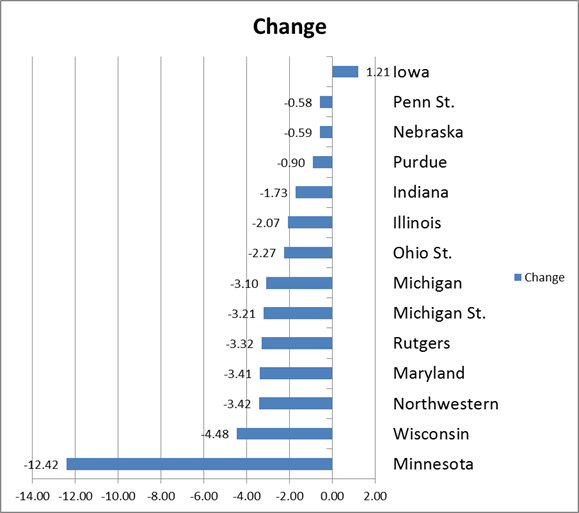 Minnesota’s 12.4% OReb% change year-over-year was by far the largest in all of college basketball (351 D-I teams, including those transitioning in). Only one other team had a change (positive or negative) of greater than 10% (Idaho St. +10.6%). Turnover percentage in 2013-14 was down throughout college basketball, dropping to 18.3% from 20.0% a year earlier. The decline is largely attributable to the increase in fouls called by referees. So, while Minnesota’s improvement in offensive turnover percentage was good last season, it wasn’t as remarkable as it may initially appear. The Gophers turned the ball over at about the same rate as the average D-I team this past year. In Tubby Smith’s last run with Minnesota, the squad’s turnover percentage was 21.5%, or 8% higher than the D-I average. The Gophers had a defensive eFG% of 48.7% (vs. D-I opponents) in 2013-14, the program’s worst since Dan Monson’s last full season in Minneapolis. Looking both at last year and what it means to the future, there are good and bad indicators. We’ll explore a few of them in this article. The bad news is that our projection quoted above was spot-on. Minnesota’s 2FG% shot up to 47.1% from 42.8%. The chart below illustrates the trend over the past six seasons. There are thousands of angles to consider when talking about the topic of Minnesota’s eFG%. Today we’ll share a select few. Often you’ll hear people, including traditional media, talk about a player’s field goal percentage when describing their game. “Player X shoots 44% from the field – that’s pretty good for a guard,” they might say. The problem with such statements is that there’s not enough information provided to make such a claim. When evaluating how well a player or team shoots the ball, we must give (among other data) effective field goal percentage proper attention. When looking at a team’s eFG%, the first things to understand are the basics – and the basics do not include overall FG%. 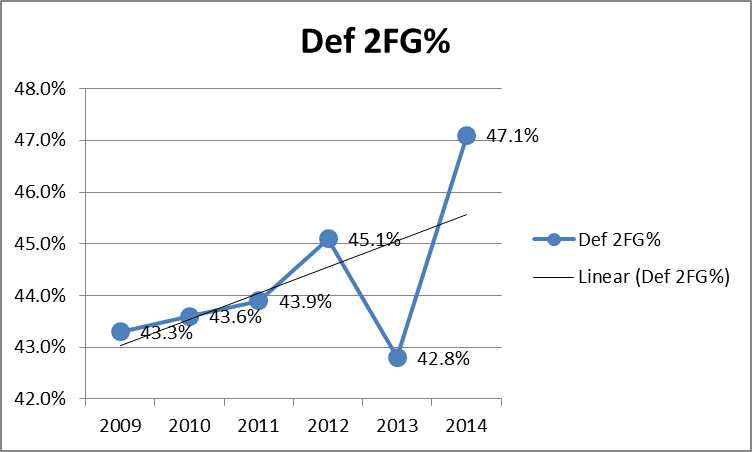 The components of eFG% are: 2FG%, 3FG% and 3FG/FGA. In other words: At what rate does a team convert 2-point and 3-point attempts, respectively, and what is the mix of shot attempts between 2-point and 3-point attempts? There are many ways to measure and argue true strength of schedule (and many ways not to – for example, claiming that the RPI’s “SOS” is a good measurement of the toughness of a schedule is a poor argument). Several things stand out, including that Michigan State and Iowa have poor records against other teams who finished in the top half of the conference. Below is Minnesota’s official team sheet heading into Friday’s games (click for larger view). If the Gophers beat Penn State tonight, they will play the Nits again on Thursday in Indianapolis. Win both games against Penn State, then lose the next, and Minnesota’s RPI projects to be approximately the same as it is today (around 50). Should Nebraska fall at home to Wisconsin this afternoon, we would like the Gophers chances better than the Huskers. As noted on the team sheet below, the two “bad losses” Minnesota has were with Dre Hollins injured. His first game back was Purdue and he did log a lot of minutes, but statistically and visually it wasn’t even close to being the real Dre. The committee can and should take this into consideration and is a reason why we wouldn’t count the Gophers out of the tournament even if they lose on Friday of next week (i.e., only win one in the Big Ten tournament). A loss today would be painful and require a run in the conference tournament. Instead of Penn State at 5:30 p.m. CT on Thursday, Minnesota would play Indiana at 11 a.m. CT. A win and the Gophers are very much in the conversation.